We are proud to be celebrating an important milestone in our orchestra’s history – 20 years of music making. 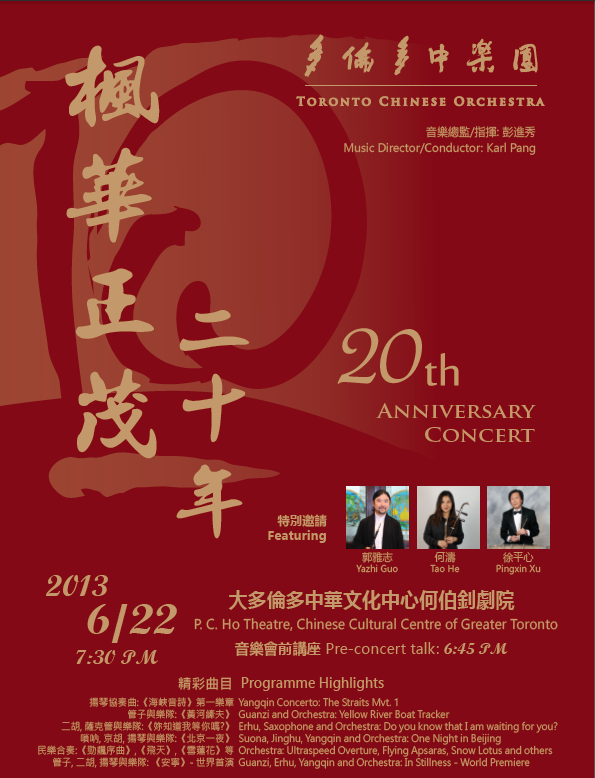 TCO’s 20th anniversary concert will be held on June 22, 2013 at the P.C. Ho Theatre of The Chinese Cultural Centre of Greater Toronto. Three renowned virtuosi will perform and celebrate with us on this important date. Mr. Yazhi Guo, performing suona and guanzi, Ms. Sarah He, performing erhu, and Mr. Pingxin Xu performing yangqin. They will perform solo, duet and trio together with the orchestra in this milestone concert. As a not-for-profit organization, we rely greatly on your continued support as sponsors and donors to continue promoting Chinese culture and music in Canada. We would not have been able to fulfill our goals without your kind and generous support. We have a variety of sponsorship options to choose from to suit your budget. If you would like more information, please contact me at 416-568-8024, or visit our website: www.TorontoChineseOrchestra.com.